There’s been quite a lot of buzz around our recent Perspective piece in Science (Baltimore et al. with alphabetical author list, open access for now), stemming from an IGI-organized bioethics workshop in Napa. Ed Lanphier et al were clearly thinking along the same lines, and wrote a similar article for Nature. The crux of the matter stems from CRISPR/Cas9’s ease of use. Germ line genome engineering has suddenly become surprisingly easy in a variety of organisms, and the same may be true for the human germ line (there are rumors that some have already tried). This is a very important time for science, and much rests on clear communication and open discourse. Since germ line edits would be heritable, we are literally talking about the ability to change human evolution faster than natural selection. Many have drawn parallels between the 1975 conference on recombinant DNA technologies in Asilomar, including ourselves (several attendees of the original Asilomar meeting were at the Napa workshop). Some worry about the futility of trying to put the genome engineering genie back in the bottle. To be clear, our position is not a call to outright ban engineering of the germ line. Instead, we ask for a halt to experiments along these lines until a much larger meeting whose attendees represent a broad cross-section of scientific, clinical, ethical, and regulatory expertise. Whether or not individual researchers have performed human germ line editing, we must stop and ask ourselves hard questions before embarking on this path in earnest. Is it acceptable to cure genetic disease? What about the introduction of naturally occurring advantageous alleles (e.g. PCSK9 mutation)? If we proceed, what safety standards should be put in place? It would be wise to hash things out before acting, rather than repenting at leisure. In addition to a larger meeting, broad communication about the science is absolutely critical. America is at a strange point: the majority of people believe that science is a good thing, but simultaneously disagree with scientists on several scientific issues. For the last few weeks I’ve been experiencing the edges of this phenomenon, when journalist after journalist asks me about designer babies. We must do an excellent job of providing high quality information to non-scientists about the genome engineering revolution in which we find ourselves. The goal is not to pedantically “educate” the public. I’ve found that everyone, from taxi drivers to accountants to personal trainers to librarians, quickly and easily grasps what human genome engineering is all about. Science fiction has been priming us for this moment for decades. The real question, which must be put to everyone, is how should we proceed now that it’s real? As announced at our Grand Opening, we’ve launched into a big collaboration with AstraZeneca to use CRISPR for basic research aimed at impacting human health. Just as important, we’ve also just started a very exciting partnership with Agilent, providing access to technologies we’ve previously only dreamed about. So what are these collaborations all about? What do we hope to do? Why are we working with companies at all? That’s exactly what we want to avoid, and we’re going to do it with two-way communication and tight collaboration. What high-risk (e.g. academic) research needs to be done in the medium term to help better therapies get to patients faster? What are new and emerging areas where breakthrough science meets potential to impact health? What are the long-term moonshots that might actually get picked up and turned into a world-changing therapy if successful? Both academic and industry scientists have strong feelings about these questions, but all too often we exist in the monoculture of our immediate environment and fail to really communicate with one another. The IGI’s collaborations with Agilent and AstraZeneca represents our first steps in the road to reversing this trend. We’ll be doing basic research together with groups from both companies, in a truly collaborative mode. We hope to both to give them insight into new and great scientific discoveries on the horizon, and also to get their insight into areas where basic research now can have a dramatic impact in the long term. I think that through collaborations with industry groups we can make a very positive impact in the fight against many diseases (stay tuned for more on the science! ); it’s going to be an exciting time! I’ve been meaning to make a wrapup post about the Keystone Genome Engineering meeting for a while and have had bits of this post in my Drafts folder for too long, but things kept getting in the way. Speaking of which, be on the look out for upcoming announcements surrounding our grand opening celebration on February 4th. This was the first meeting in which I live-tweeted (@igisci, #kssynbio), and overall I think the experience was positive (for me, at least). 140 characters really makes one think carefully about the critical take-home of each talk. There’s no danger of tweets replacing meeting attendance, but think of them as little advertisements for interesting research. My only complaint is that short talks chosen from the abstracts are exhausting to cover! As usual, I was blown away by the speed at which the genome editing field has been moving. I maintain a list of organisms in which Cas9 has been used successfully and this single meeting added many items to that list. The ability to make targeted changes in a dizzying array of living cells and organisms makes this a very exciting time to be doing science! No doubt we’ll take this all for granted in 5-10 years (however long it takes for new students to view the ability as business-as-usual), and frankly that will probably be for the better. I’m interested in getting Cas9 to do all sorts of new and interesting things because of the biology it enables, not because I like bells and whistles for their own sake. But are we moving so fast that we’re neglecting to think about where it’s all heading? Another teaser: check the IGI website for more on a recent, wide-ranging discussion about that very topic. A focus on technology was apparent at the meeting, where people presented new methods but were almost shaking with anticipation at the thought of all the interesting science their tools made possible. Perhaps that was the take-home of the conference, which was joint between genome engineering and synthetic biology. Genome engineers are driven to develop new technology by the promise of uncovering biological insights and creating impactful therapies. Synthetic biologists have a similar technology drive to engineer exciting new biologies, with huge implications for our world. But while both groups are in a phase of intense technology development, we’re all doing this to derive fundamental insights and better the human condition in some way. The mountains around Big Sky, Montana (where the conference was held) certainly did their own part to better my own human condition. I’m at the Keystone Genome Engineering and Synthetic Biology meeting all this week. The first day was fantastic, with the short talks especially knocking my socks off. I was a bit disappointed with the longer CRISPR talks, not because of the science (which was great), but because most chose to solely present published data. This is a fast-moving field and I can understand a hesitance to tip one’s hand. But one purpose of meetings is to foster new collaborations. Case in point, one short talk presented unpublished data that’s wonderfully complementary to some of our own work, and I’m now talking with the presenter about putting together a joint publication. Everyone depositing resources to Addgene helps the field advance quickly, but we could be at light speed by working together. It’s a brand new year, and lots to do! The IGI is having our official Grand Opening in February; we’re teaching an open CRISPR Workshop in July with Dana Carroll organizing and lecturers include Jennifer Doudna, Jonathan Weissman, myself, and more (check our website for more details on how to apply after January 30th); and we’re convening a bioethics retreat very soon. Not to mention all the goings-on in the lab, including three new postdocs starting before March. Exciting times! I’ll be in Big Sky, MT for the next week at the Keystone Genome Editing and Synthetic Biology meeting. I’m looking forward to hearing some great talks, catching up with friends I haven’t seen in a while, and generally immersing myself in interesting science. I’m also looking for talented and motivated research scientists and postdocs. No CRISPR experience necessary, feel free to come up and say “Hi” if you’re curious about the IGI. I find conferences to be a great way to even further boost my excitement about projects in the lab — by the end I’m worked up about all the new ideas, collaborations, and projects spurred by conversations with unexpected people. The boost might also relate to the copious amounts of coffee I inevitably end up drinking. Perhaps this time I’ll try water during the coffee breaks. Check the @igisci twitter feed and this blog for updates from the conference. Don’t expect liveblogging, but I’ll post general thoughts as they come. There’s nothing like hands-on experience to figure out how something works. In that spirit, I worked with 3D Molecular Designs to get a deconstructable, 3D printed model of Cas9 doing its thing. The model is based on the Jinek lab’s recent structure of Cas9 bound to PAM-containing DNA, with some artistic license to build in the full non-complementary strand and the upstream and downstream duplexes. I think the model tuned out extremely well and beautifully illustrates how Cas9 tightly binds DNA by using the sgRNA protospacer. It also very concretely highlights some interesting mysteries about the structure, such as the HNH active site pointing towards the wrong DNA strand. Just the few hours I’ve been playing with this model have led to some neat insights. Edit: correctly linked to 3D Molecular Designs instead of MSOE (sister organizations). If you’re just getting into CRISPR/Cas9 editing, you might be a bit overwhelmed by all of the options available to you. Especially if you’re working in human cells. 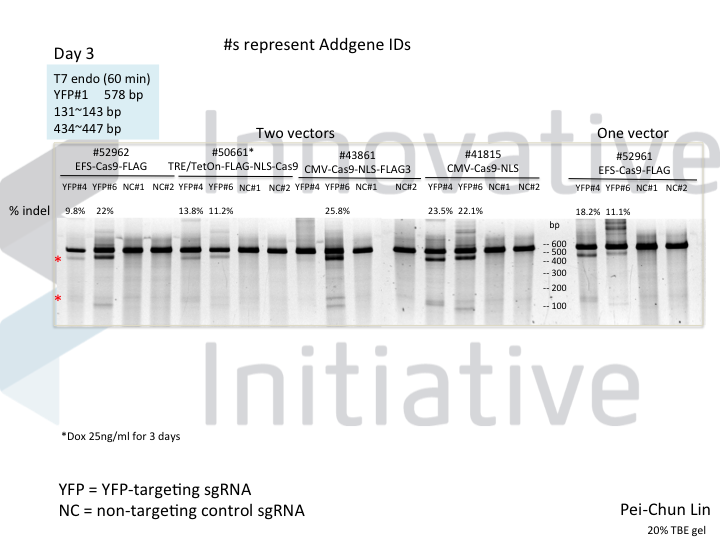 I mean, just take a look at at the Addgene mammalian CRISPR page! Which one to choose!? There are various tags, numbers of NLSes, tag/NLS locations, promoters, sgRNA+Cas9 in one vector, and the list goes on. As you might expect, all systems work when given a great sgRNA (phew! ), with varying efficiency (compare guide YFP#6 between Cas9s). 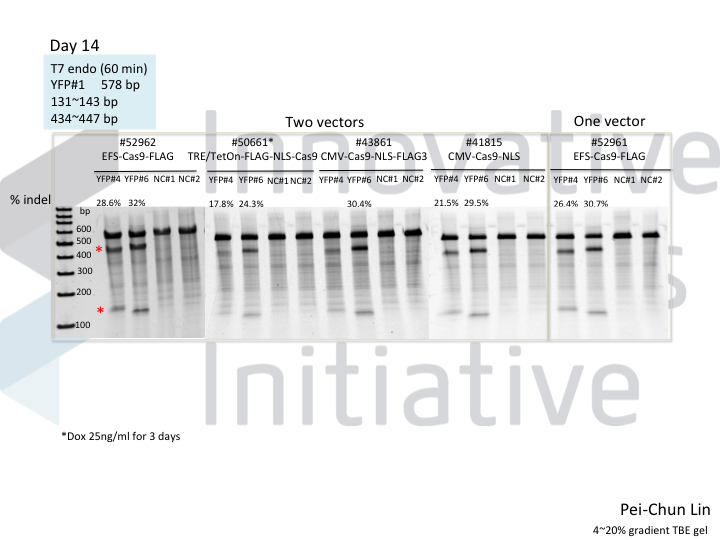 The Cas9 system with the lowest apparent activity (Addgene #50661) has the big benefit of inducibility, so there’s still a great reason to use it. But the different efficiencies mean that sgRNAs that look decent with one Cas9 vector can appear inactive when paired with another (e.g. 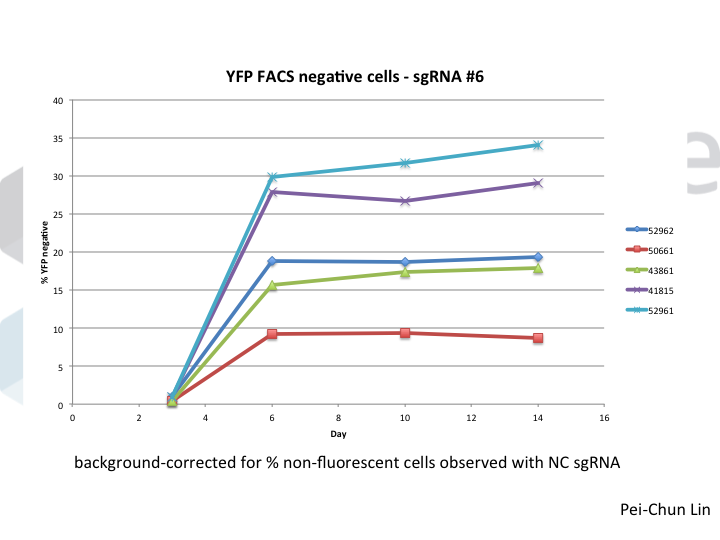 compare guide YFP#4 when used with Cas9 #41815 vs #43861). Pei-Chun’s data also highlight the temporal difference between mutation and protein abundance (as might be caused by highly stable proteins). Genomic edits were easily detectable after 3 days by T7E1, but it took 6 days to even begin detect a change in protein abundance. Not unexpected, given the known stability of XFPs, but keep this in mind next time you plan a Western or other protein-based assay to read out Cas9 activity! I just had a great conversation with Dana Carroll and Mark DeWitt about ways one might improve homology-directed repair. But the proof will be in the pudding. I’m sure many (many, many, many) groups are working to crack this particular nut, but so far it’s been recalcitrant. Cells just love to use NHEJ instead of HDR, which is great for making knockouts but not so good for true editing. 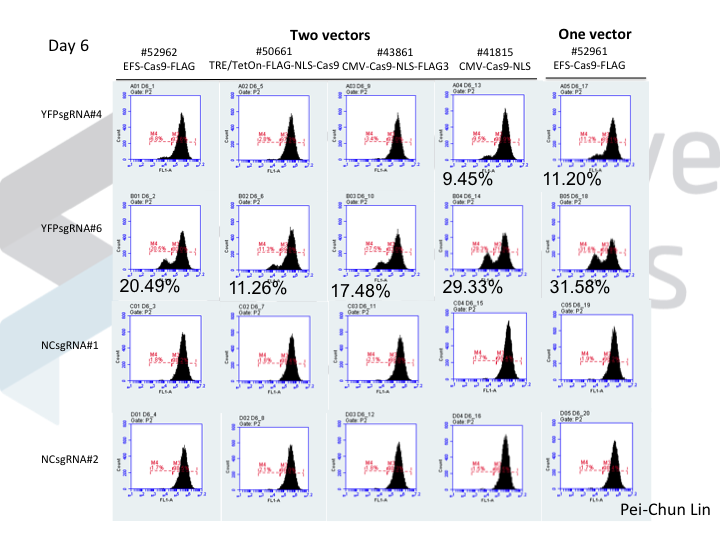 Lots of exciting advances out in the literature, including the Cas9 mouse and genome-wide screening with CRISPRi+CRISPRa. More on the screening at a later date, but how about that mouse? The Cas9 mouse is a great proof-of-concept tool that brings mouse genetics to the people and I think will both accelerate research and decrease frustration. Cutting in the brain looks outstanding, and making knockouts in primary immune cells was a great idea. Editing in the lung looks a bit more iffy, and from Figure 1 it’s not clear to me whether the problem is AAV delivery of sgRNA or Cas9 expression (highest in brain but relatively low in lung). Regardless, getting simultaneous knockout of two genes and editing of another is quite a feat! But the very mosaic nature of the mutations will probably restrict this to making changes that lead to hyperproliferation, such as loss-of-function tumor suppressors or gain-of-function oncogenes. Though I wouldn’t bank the farm on results from knockouts in Cas9 mice alone, one potential utility is proof-of-concept to trigger a traditional transgenic animal. It’s not uncommon to spend the huge time and effort involved in making a transgenic mouse but find no phenotype. 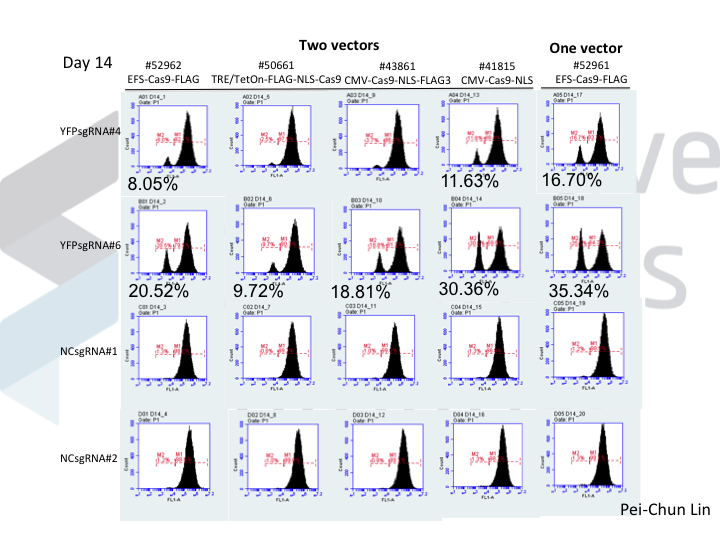 With the Cas9 mouse, one could test several candidates for phenotype and then make the clean transgenic (including backcrosses) in promising-looking cases. And with more efficient editing (coming in v2? ), this might truly be a game-changer. It’s definitely recommendation-letter-writing season here at the IGI (multiple postdocs applying for fellowships, graduate rotation students going for the NSF, a friend is applying for academic jobs, and two people who reported to me while I was in biotech are up for promotions). Pairing that with several new students and some other exciting developments (more on that later) has led me to unfortunate delays between blog posts. Yesterday I had a very interesting conversation with Hopi Hoekstra, who was visiting Berkeley to speak for this year’s Allan Wilson Memorial lecture. Her talk was fabulous, and during our one-on-one she made the great point that the Cas9 literature is moving so fast that it’s hard for people in various model organisms to keep track of what’s going on. What works best in mice? How about in flies? Nematodes? Planaria? Wheat? The list goes on and on. It’s sometimes hard for me to keep up, and this is my field! Imagine what it’s like for someone in (for example) EvoDevo who doesn’t care about the tech and just wants to know what will work to answer their question. It’s clearly too much for any one person to collate while still doing their day job. But Hopi had the great idea to start some kind of community-led effort. People working with each model organism would contribute to resources (or forums?) that would provide primers for labs wanting to get started (or do a better job) in their area of interest. And a general resource to touch on the latest-and-greatest that could help everyone. This would be some kind of organized but open format, where anyone could contribute but information was relatively easy to find. Great idea, right? But how to actually get it started… A wiki? A Google Group? At the risk of becoming structure-centric (three crystal structures in four posts), I couldn’t pass up commenting on the Jinek Lab’s beautiful structure of SpyCas9 in complex with sgRNA and target DNA including an NGG PAM. One big take-home here is that the PAM is read out by two arginines (1333 and 1335) and a lysine (1107). 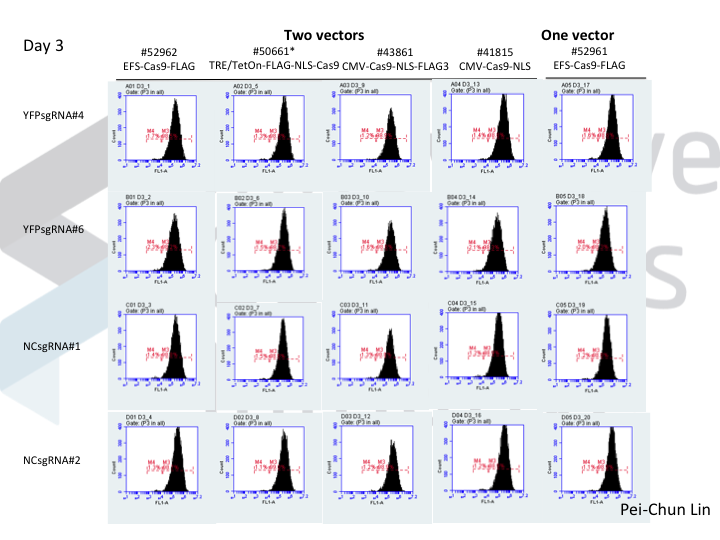 The PAM itself is hybridized to the non-target DNA strand, but the DNA immediately downstream is flipped 180 degrees so that it can be read out by the RNA protospacer! This bit of structural juggling is made possible by a serine, which together with a backbone contact forms an interaction the authors term a “phosphate lock”. Like any great science this paper raises as many questions as it answers. Mutating the PAM-contacting arginines to alanine abolishes DNA binding, but switching them to the identities found in organisms with non-NGG PAMs doesn’t switch PAM specificity. So is it even possible to make SpyCas9 recognize other PAMs? You can bet that many groups are working on that very problem, and I’m sure this paper has given them some ideas.